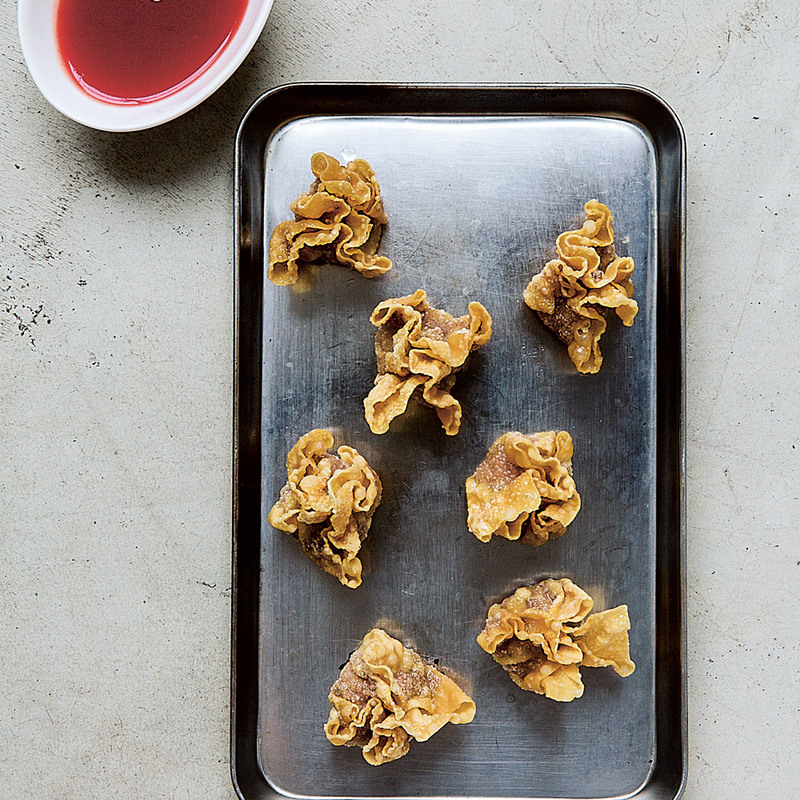 These deep-fried wontons couldn’t be more simple and classic, but they offer a huge flavor upgrade over takeout. Slideshow: More Asian Recipes This recipe originally appeared in CHINA: THE COOKBOOK by Kei Lum and Diora Fong Chan. To make the sauce, combine the sugar and vinegar in a small bowl, mix well, and set aside. Score the base of the tomatoes. Bring a small saucepan of water to a boil, add the tomatoes, and heat for 1–2 minutes. Immediately transfer to a bowl of ice water. When the tomatoes are cool enough to handle, peel away the skin. Cut into chunks and set aside. For the filling, combine both porks, soy sauce, cornstarch (cornflour), sugar, and sesame oil in a bowl. Fill a small bowl with cold water. Take a wonton wrapper and lay it flat on a cutting board. Put 1/2 tablespoon of the pork filling in the center of the wrapper. Lift the edges of the wrapper and twist to form a parcel. Dab a little water on the ends and press tightly to seal. Repeat with the remaining wrappers and filling. Heat the vegetable oil in a wok or deep saucepan to 350°F/180°C, or until a cube of bread browns in 30 seconds. Gently lower the wontons, in batches, and deep-fry for 1–2 minutes until golden. Use a slotted spoon to carefully remove the wontons from the hot oil and drain them on paper towels. Pour out most of the oil, leaving about 1 teaspoon in the wok. Add the chitterlings (pig's intestines) and tomatoes and stir-fry over medium heat for 2 minutes. Stir in the brown sugar and vinegar, and cook until the sugar has dissolved. Strain, if desired. Serve the wontons with the sweet and sour sauce. 1. Barbeque pork from page 394 of "CHINA: THE COOKBOOK." 2. The wontons can be frozen for up to a month. Spread out the uncooked wontons on a plate, freeze until firm, and then transfer them to a freezer bag. When ready to serve, place the frozen wontons into a saucepan of cold water and bring to a boil over medium-high heat. When the dumplings float to the surface, add 1/4 cup (2 fl oz/60 ml) cold water and return to a boil.